In the South, church is very much a way of life and a part of the natural order of things for many people. One of the first things people look for when they move to a new town is a church home. For some denominations, this is easy because they usually just move their membership to the local adjunct of the church they are affiliated with; for others, it might be a very laborious and intensive search to find just the right fit for their spiritual and family needs. Here in my part of the South, there are two predominant congregations of the protestant persuasion; Baptists and Methodists, or more specific to my area, Southern Baptists and United Methodists. Following along behind that are the Presbyterians, Catholics, Episcopalians, Church of Christ and numerous independent churches of no particular order, some old, some new. Get closer into Atlanta and you could find houses of worship for those of non-Christian faiths but out here in the country, your choices are not as wide. I profess to all to be firstly a Christian and second a United Methodist, and this I have done for my entire life, although I will admit that I am a sort of hybrid, which is not unusual in the south. My parents were both United Methodists but my grandparents were half Baptist and half Methodist. My dad’s father was a United Methodist clergyman who married a Baptist and converted her and he was active as a pastor until I was 8 years old. I remember well going to visit them in places where he was sent to serve: Rome, Augusta and Clarkdale were the three he served in during my childhood before he retired. 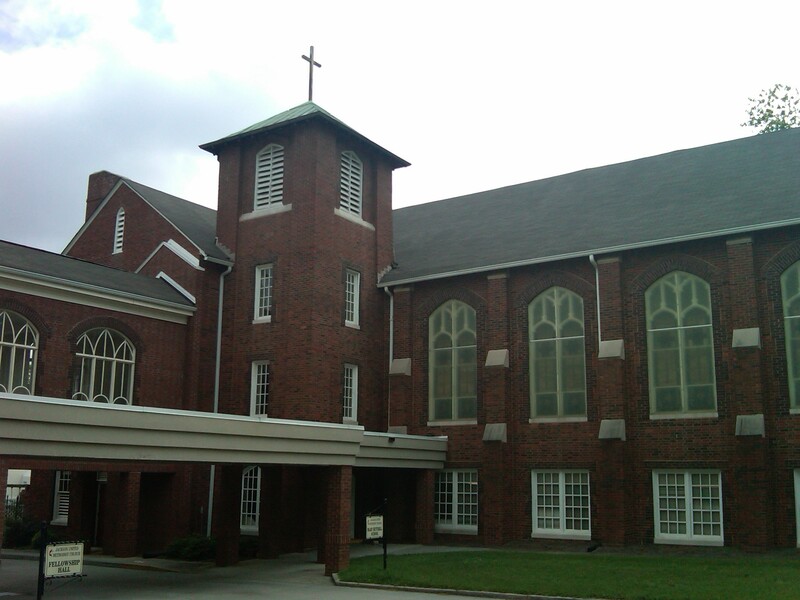 Even though I was a Methodist, I attended a number of services at the Baptist Church growing up as well. My aunt married a Baptist and became one and my other grandfather married a Methodist but never left his church; they attended church separately even though you could throw a rock from one church to the other. As a child, Communion Sundays were my favorite because they provided refreshments (in my eye at the time) consisting of grape juice and soda crackers and much less sermonizing. The Baptist church had waiters to bring it to you and the Methodist Church was a buffet line. The Baptists also had swimming pool inside the church (that I never got to swim in of course) and the Methodists had a water fountain for sprinkling babies when they were christened. I don’t remember my christening/baptism as I was only four months old when I was “sprinkled” but I have a wonderful picture of my grandfather in his white robe holding me as he performed this and I understand it was the only moment during the service that I wasn’t screaming. As I grew a little older, I learned how to “lean on the everlasting arms”, discovered that there was “power in the blood” and that there was an “old rugged cross” on a hill far away, which I assumed to be in Huntsville Alabama because there was indeed a hill over there with a very large cross on it and it was a pretty “far away” drive over there. Sunday School was a lot more fun than regular school because it only lasted an hour, we got to make neat things and we learned that not only did Noah find Grace in the eyes of the Lord, but that his ark was actually made by Fisher-Price. From a young age, we learned that there is a lot of ritual in the traditional United Methodist Church, from recitations made each Sunday to the religious vestments worn by the participants in the service. This is ingrained into your system early so that you are intimately familiar with the Methodist structure and can be pretty much assured that anywhere you go, in any city or any country that speaks your language, of being able to walk into a Methodist Church and have a fairly good idea what is going on-kind of like being in the Rotary or Kiwanis and knowing you are a part of a collective group of individual churches. Baptist churches, on the other hand, are often part of a convention but each one can be very different-preaching styles, music styles and so forth. One thing Methodists and Baptists have in common though….they all like to eat good food and when the two churches aren’t racing each other to the local restaurants before the organ has finished its final notes, they are usually having a dinner at church, a ritual steeped in tradition and fried in Crisco. In the South, espcially in the Methodist Church, we have something known as a “covered dish dinner” and since “dinner” can refer to either “lunch” or “supper” in the South, the term is good for either the noon or evening meal. A covered dish dinner affords three major opportunities at church: first, it allows the entire congregation to share in a fellowship together doing something that brings out the best in most everyone. Second, it allows some of the best cooks in the church to prepare the dishes that they are best at making, usually from scratch….and third, it allows me to have access to some of the best assortment of food known to the art of culinary sciences, prepared by Southern gourmet church ladies from recipes handed down for generations. My grandparents who lived in a tiny town just north of where I grew up went to separate churches as I mentioned but oftentimes, the two churches would get together for a covered dish dinner after their services were over, pooling their resources and bringing the whole town together for fellowship. In my own church, up until about ten years ago, our church fellowship hall (fancy name for dining room) was directly below our sanctuary. On a covered dish dinner Sunday, the master cooks of the church would bring in the food-dozens upon dozens of Tupperware dishes, each one labeled with a piece of masking tape bearing the identity of the owner of the dish, and these would be brought into the kitchen area for processing. Meanwhile, other ladies would fire up the ovens and begin to heat dinner rolls for consumption at the feast….but this sometimes presented a problem….you see, the kitchen was directly below the room that housed the inner workings of the pipe organ and the pipe organ gets its power by sucking in huge amounts of air and forcing them through the musical pipes, all of which are exposed to the sanctuary…so it got to be very hard sitting in church with meal preparations going on downstairs because every time a hymn was played, the organ would blow the aromas from the kitchen into the sanctuary, bringing with it the smell of baking bread, roast beef, turkey, ham and many other wonderful dishes….and it would get very hard to concentrate on the service with that aroma in the air. We would be singing “When we all get to Heaven” or “Rock of Ages” but in our minds we were singing “When we all get to dinner, what a day of rejoicing that will be” or “Rows of biscuits, baked for me”…..
Generally the pastor, either sensing the misery of the congregation or possibly finding it hard to concentrate on the service due to their own rising hunger, would cut the service a few minutes short, deliver the blessing in the sanctuary and then dismiss the members to go and commit gluttony. We would pour down the stairs like ants into the fellowship hall to “feast at that heavenly banquet table”, loading up the Chinette paper plates to the breaking point with meats, garden grown vegetables, bread, salads and of course, devilled eggs. The first thing to go was always the devilled eggs, because no matter how many were brought, there was never enough for everyone to have them so you had better be early in the food line if you wanted them. Similar foods would be grouped together and if you ate enough of these meals, you could identify the fried chicken made by Mrs. So-and-So who made the BEST fried chicken in the church or the green beans grown by Mr. X and cooked by Mrs. X to perfection, or the fried okra that had won Miss Blank the blue ribbon in the county fair of 1950, years before I was born but still talked about today. Did I mention that we liked things fried down in the South? Copious amounts of sweetened iced tea would be consumed to help wash all that down before heading over to the desert table to indulge in fried apple pies, cakes, cookies, brownies and other assorted goodies. The cupcakes in the plastic A&P bakery container would be largely ignored, as would anything else store-bought. Once this ritual feasting had come to an end and the appetites of young and old were satiated, the adults would sit back and talk while the kids would be released to run unsupervised in the yard (times were simpler then; you wouldn’t think of doing that today). The ladies would wash the Tupperware, the men would take out the trash and fold up the tables and then everyone would go home and do nothing for the rest of the day but nap or play outside. You would swear that you could go until next Sunday without eating again and be just fine. Praise and worship was always the main reason for going to church but the food sure did add a little extra encouragement and you could always count on attendance being up a little on those days. Some of my best memories through my whole life are of church, not just my church but of countless little churches I’ve attended all over the South. Memories of pastors come and gone, church members who helped mold me and inspired me, many of them now departed, of Sunday school picnics and family reunions at the holidays, singing hymns, listening to preaching and enjoying the fellowship of the church family. Our churches, like fried chicken, are very much a part of life in the South and should never be taken for granted because that is where we go to recharge our spiritual batteries, replenish our souls and occasionally, if we are lucky, fill our stomachs. This article was originally published in May of 2010 before I established my blog with WordPress and is now being republished.